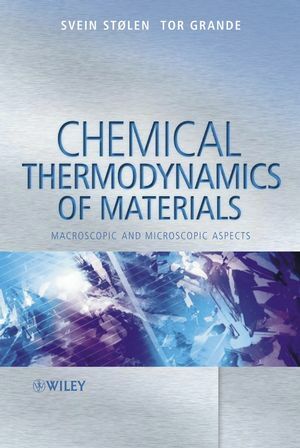 A comprehensive introduction, examining both macroscopic and microscopic aspects of the subject, the book applies the theory of thermodynamics to a broad range of materials; from metals, ceramics and other inorganic materials to geological materials. Focusing on materials rather than the underlying mathematical concepts of the subject, this book will be ideal for the non-specialist requiring an introduction to the energetics and stability of materials. Macroscopic thermodynamic properties are linked to the underlying miscroscopic nature of the materials and trends in important properties are discussed. Professor Svein Stolen was born in 1960. He is Professor at the University of Oslo, Norway in the department of Chemistry. His e-mail address is svein.stolen@kjemi.uio.no Svein has written about 80 scientific research papers, published in journals worldwide. Professor Tor Grande was born in 1963. He is Professor in the Department of Materials Technology, at the Norwegian University of Science and Technology, Trondheim, Norway. His e-mail address is tor.grande@material.ntnu.no Tor has written about 80 scientific research papers, published in journals worldwide. 1.2 The first law of thermodynamics. 1.3 The second and third laws of thermodynamics. 1.4 Open systems and non-expansion work. 2.1 Phases, phase transitions and phase diagrams. 3.5 Integration of the Gibbs-Duhem equation. 4.1 Binary phase diagrams from thermodynamics. 5.1 Supercooling of liq uids - superheating of crystals. 5.3 Metastable phase equilibria and kinetics. 6. Surfaces, interfaces and adsorption. 6.2 Surface effects on heterogeneous phase equilibria. 7. Trends in enthalpy of formation. 7.2 Compound energetics: rationalization schemes. 7.3 Solution energetics: trends and rationalization schemes. 8. Heat capacity and entropy. 8.1 Simple models for molecules and crystals. 8.4 Heat capacity contributions of electronic origin. 8.5 Heat capacity of disordered systems. 9.1 Lattice models for solutions. 9.2 Solutions with more than one sub-lattice. 10.1 Determination of temperature and pressure. 11. Thermodynamics and materials modelling (by Neil L. Allan). 11.1 Interatomic potentials and energy minimization. 11.2 Monte Carlo and molecular dynamics. 11.4 Applications of quantum mechanical methods.